A Quiet Place has made over $50 million at the North American box office alone off of an initial $17 million budget and it's been receiving quite the buzz since its number one opening weekend. One of the most often talked about aspects of John Krasinski's horror movie is the clever use of silence and unique sound design that practically makes the viewer's heart stop. 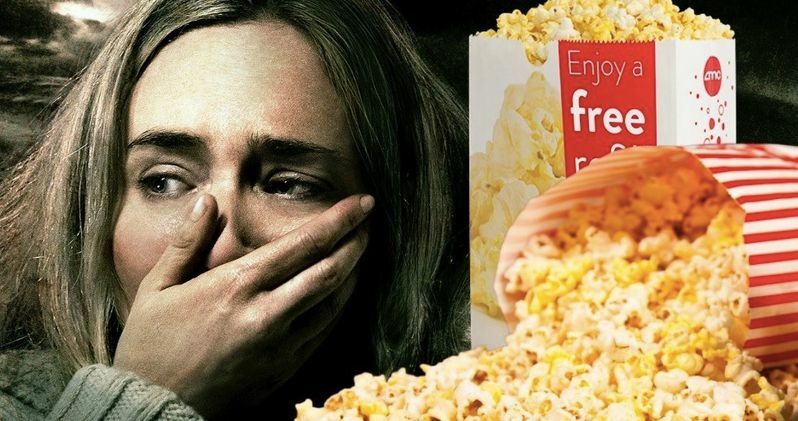 And now, viewers have admitted that A Quiet Place made them too nervous to eat in the theater because of the deafening silence. John Krasinski has called the sound editing of A Quiet Place, "a sound designer's dream," and for Academy Award winning sound editors Ethan Van der Ryn and Erik Aadahl, it certainly was. But fans of the horror movie believe that Van der Ryn and Aadahl did too good of job while doing the sound design and have taken to social media to vent their frustrations about not being able to eat during the practically silent film. One fan simply said, "trying to eat popcorn during A Quiet Place was exhausting." Another fan revealed, "anytime I tried biting into my Reese's pieces while watching A Quiet Place I felt like I was risking the safety of the theater." Some fans of A Quiet Place have noted that the most horrifying aspect of the movie isn't even the visuals on the screen or the silence. Instead, it's that when one sits in the theater and realizes that they're going to have to try and eat as silently as possible while trying to hear others take every sip of their beverage. One fan even noted that she could even sense that fellow moviegoers were even breathing quieter as well. She explains. "I watched A Quiet Place tonight. I noticed that everyone slowly stopped eating their popcorn, so they wouldn't be making any noise. People started breathing quieter too." In a recent interview talking about the sound design of A Quiet Place, Ethan Van der Ryn and Erik Aadahl were asked if they were taking revenge on noisy popcorn eaters. It certainly seems that way for many people who have seen the horror movie on the big screen. Aadahl had this to say about noisy eaters in the theater. "Yeah, they will become the hunted by fellow moviegoers if they're opening up their little candy wrapper (laughs)." It's unclear if movie theaters have started to lose some sales from A Quiet Place screenings, but it seems that could end up happening soon after word begins to spread. Either that or people will make an effort to eat all of their goodies before heading in to fully immerse themselves into the horror movie. So, consider yourself warned and don't bring a bunch of noisy food and drinks into A Quiet Place, unless you want to be the hunted. You can check out some of the tales from scarred moviegoers below and read more about A Quiet Place at Paramount Pictures. Getting yourself some food when everyone else is asleep is the real life equivalent to trying to survive in A Quiet Place. If you watch A Quiet Place, don’t bring food. I had to strategically eat my hot dog. Don’t even bother with pretzels.